Education: BCom, MPhil, MEd and PhD degrees from the Australian National University. Professional Experience: My research interests are broad, and include Corporate Finance, Multinationals, Tax, International Finance, Asset Pricing, Welfare/Retirement/Superannuation/Pension systems, Risk Management, Capital Markets, Market Efficiency, Liquidity, Behavioural Finance, Financial Systems and Higher Education. I am an active researcher and present my work regularly at international and Australian conferences including the American Finance Association Conference. A number of my research papers received local and international prestigious awards. For my research, I often visit some international Universities in the US and Europe, including Harvard, MIT and Stanford among others. I have conducted a number of consulting work in the industry. I have a broad teaching portfolio encompassing both undergraduate and postgraduate courses. I also supervise Honours, Masters and PhD students. 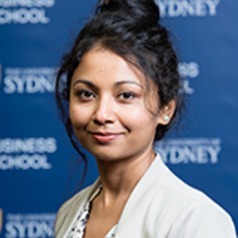 Research Fellowship by the Australian Research Council; She has been awarded the Vice-Chancellor's Award for Teaching Excellence; Pearson Teaching in Excellence award; and also the "Top Supervisor" Award.